Lose yourself in the ethereal beauty of this luxurious Chocolate Opal, set upon a band of 14ct Strawberry Gold and surround by a halo of Vanilla Diamonds with dazzling Chocolate Diamond shoulders. Utterly mesmerising, this beautiful ring is the perfect accessory for glamorous occasion. 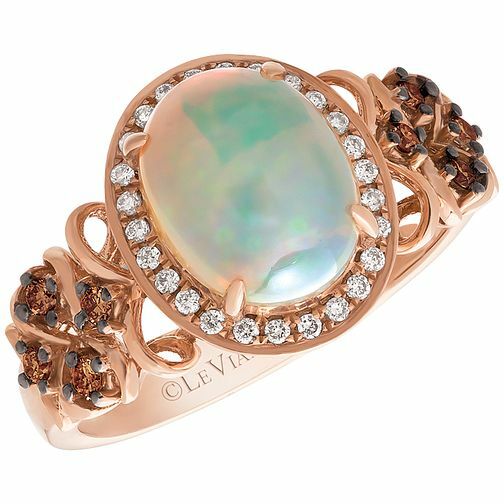 Le Vian 14ct Strawberry Gold Opal & Chocolate Diamond Ring is rated 5.0 out of 5 by 1. Rated 5 out of 5 by Anonymous from Stunning Opal The colours that run through the opal are stunning and the detail on the shoulders unique. The only down side is I thought that the band would be thicker and its quite thin, but I think thats only because Im comparing to all my other 14ct rings. Saying that it is truly beautiful, so I would definitely recommend and you will get comments on it as its different.